French painter Pierre Bonnard (1867 - 1947) was known for his bold color in his many paintings, many of which depicted wife Marthe. Artist Bonnard drew his various subjects, rather than painting from life. After taking meticulous notes regarding the color of his subjects, Bonnard would then use those notes to translate the subjects onto canvas in the comfort of his home. Pierre Bonnard was one of the founding members of Les Nabis, a group of French artists in the late 1800s who paved the way for revolutionary Post-Impressionistic fine art and graphic art. Along with Pierre Bonnard, other artists who headed Les Nabis included Maurice Denis, Edouard Vuillard, Paul Sérusier and Paul Gauguin. Medium: etching and drypoint. Catalogue reference Terasse 59. This original Bonnard etching was printed in Paris in 1927 for the hard-to-find Charles Terrasse catalogue raisonné, published by Henri Floury in an edition of 1500. This impression is printed on cream wove paper; the plate size is 8 1/2 x 6 1/4 inches (218 x 160 mm). Signed in the plate with Pierre Bonnard's monogram signature, not hand-signed. Medium: original lithograph. Catalogue reference: Bouvet 82. This is an interpretation by Pierre Bonnard of one of Paul Cezannes's compositions, published in Paris in 1914 by Bernheim-Jeune for the rare volume "Cezanne". This impression is one of 400 printed on wove paper (from a total edition of 600). The image size is 8 3/4 x 3 1/4 inches (148 x 83 mm) and the total sheet with full original margins measures 15 x 11 inches (383 x 280 mm). Not signed. Medium: original lithograph. This impression is from the very small edition of 20 printed on japon paper (180 were printed on Arches wove paper, for a total edition of 200). All were printed by Andre Clot for the rare "Eloge de Pierre Bonnard" by Leon Werth, published in 1946 by Manuel Bruker. The lithographs from Eloge are beautiful and subtle -- fine examples of the artist's later work (Bonnard died the next year in 1947). Image size: 4 1/2 x 5 3/4 inches (115 x 145mm); the total sheet measures 12 3/4 x 9 3/4 (325 x 250mm). Not signed -- no impressions were hand-signed. The lithographs from Eloge are beautiful and subtle -- fine examples of the artist's later work (Bonnard died the next year in 1947). Image size: 6 3/8 x 4 7/8 inches (163 x 125mm); the total sheet measures 12 3/4 x 9 3/4 (325 x 250mm). Not signed -- no impressions were hand-signed. Note: Unlike the standard edition, this impression on japon paper is completely without printed text. This fact, along with its greater rarity, accounts for the difference in price. Medium: original lithograph. Printed by Mourlot Freres in 1947 for Verve (volume 17-18 "Couleur de Bonnard"). Sheet size: 13 3/4 x 10 inches (345 x 252 mm). A nice impression on watermarked Marais wove paper with fresh, unfaded color. Signed in the plate, not by hand. Condition: there is a vertical crease near the left edge of the sheet. Medium: original lithograph. This impression is from the edition of 180 printed on Arches cream wove paper (a small edition of 20 were printed on japon paper, for a total edition of 200). All were printed by Andre Clot for the rare "Eloge de Pierre Bonnard" by Leon Werth, published in 1946 by Manuel Bruker. The lithographs from Eloge are beautiful and subtle -- fine examples of the artist's later work (Bonnard died the next year in 1947). Image size: 7 3/4 x 5 3/4 inches (198 x 148mm); the total sheet measures 12 3/4 x 9 3/4 (325 x 250mm). Not signed -- no impressions were hand-signed. Condition: there is a bit of foxing in the margin. The lithographs from Eloge are beautiful and subtle -- fine examples of the artist's later work (Bonnard died the next year in 1947). Image size: 7 3/8 x 5 3/4 inches (189 x 145mm); the total sheet measures 12 3/4 x 9 3/4 (325 x 250mm). Signed in the plate (not by hand) -- no impressions were hand-signed. The lithographs from Eloge are beautiful and subtle -- fine examples of the artist's later work (Bonnard died the next year in 1947). Image size: 5 1/2 x 5 3/4 inches (140 x 145mm); the total sheet measures 12 3/4 x 9 3/4 (325 x 250mm). Not signed -- no impressions were hand-signed. Medium: lithograph (after the watercolor and mixed media). Beautifully printed in Paris by Mourlot Frères for the deluxe art revue Verve (Vol. 2, No. 5-6) in 1939, and published by Teriade. Sheet size: 14 x 10 1/4 inches (355 x 260 mm). There is another lithograph printed on the back, as issued. Not signed. The lithographs from Eloge are beautiful and subtle -- fine examples of the artist's later work (Bonnard died the next year in 1947). Image size: 4 3/4 x 4 1/2 inches (120 x 115mm); the total sheet measures 12 3/4 x 9 3/4 (325 x 250mm). Not signed -- no impressions were hand-signed. The lithographs from Eloge are beautiful and subtle -- fine examples of the artist's later work (Bonnard died the next year in 1947). Image size: 5 x 2 3/4 inches (130 x 70mm); the total sheet measures 12 3/4 x 9 3/4 (325 x 250mm). Not signed -- no impressions were hand-signed. The lithographs from Eloge are beautiful and subtle -- fine examples of the artist's later work (Bonnard died the next year in 1947). A small but beautiful composition: the image size is 2 3/4 x 1 3/4 inches (70 x 45 mm) and the total sheet measures 12 3/4 x 9 3/4 (325 x 250mm). Not signed. Medium: original lithograph. This impression is from the edition of 180 printed on Arches cream wove paper (a small edition of 20 were printed on japon paper, for a total edition of 200).All were printed by Andre Clot for the rare "Eloge de Pierre Bonnard" by Leon Werth, published in 1946 by Manuel Bruker. The lithographs from Eloge are beautiful and subtle -- fine examples of the artist's later work (Bonnard died the next year in 1947). Image size: 6 3/8 x 4 7/8 inches (163 x 125mm); the total sheet measures 12 3/4 x 9 3/4 (325 x 250mm). Not signed -- no impressions were hand-signed. Note: there is printed text above the image and on the back, as published. The lithographs from Eloge are beautiful and subtle -- fine examples of the artist's later work (Bonnard died the next year in 1947). Image size: 4 3/4 x 4 1/2 inches (120 x 115 mm); the total sheet measures 12 3/4 x 9 3/4 (325 x 250mm). There is printed text above and beneath the image and on the back, as published. Not signed -- no impressions were hand-signed. Condition: there is some foxing. 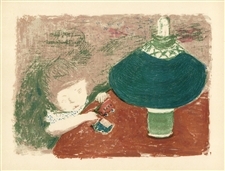 Pierre Bonnard lithograph "L'Enfant a la lampe"
Medium: multi-stone color lithograph (after the original Bonnard lithograph). Printed in Paris on Renage paper in 1952 by the Mourlot atelier, in faithful recreation of the original. According to the publisher, "the lithograph was pulled by Mourlot Freres in the same technique, using the same color range and number of stones as originally employed by the artist". The image measures 7 1/2 x 10 1/2 inches (190 x 265 mm). The total sheet is 9 1/2 x 12 1/2 inches (240 x 315 mm). There is printed text on the back, as issued. Not signed. 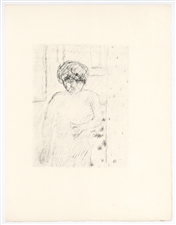 Pierre Bonnard lithograph "La Petite Blanchisseuse"
Medium: multi-stone color lithograph (after the original Bonnard lithograph). Printed in Paris on Renage paper in 1952 by the Mourlot atelier, in faithful recreation of the original. According to the publisher, "the lithograph was pulled by Mourlot Freres in the same technique, using the same color range and number of stones as originally employed by the artist". The image measures 9 1/4 x 6 1/4 inches (238 x 160 mm). The total sheet is 12 1/2 x 9 1/2 inches (315 x 240 mm). There is printed text on the back, as issued. Signed in the stone, not hand-signed. Pierre Bonnard lithograph "Ballets Russes"
Medium: multi-stone color lithograph (after the original Bonnard lithograph). Printed in Paris on Renage paper in 1952 by the Mourlot atelier, in faithful recreation of the original. According to the publisher, "the lithograph was pulled by Mourlot Freres in the same technique, using the same color range and number of stones as originally employed by the artist". The total sheet (including margins) is 12 1/2 x 9 1/2 inches (315 x 240 mm). There is printed text on the back, as issued. Not signed. Pierre Bonnard lithograph "France - Champagne"
Medium: multi-stone color lithograph (after the original Bonnard lithograph). Printed in Paris on Renage paper in 1952 by the Mourlot atelier, in faithful recreation of the original. According to the publisher, "the lithograph was pulled by Mourlot Freres in the same technique, using the same color range and number of stones as originally employed by the artist". The total sheet (including margins) is 12 1/2 x 9 1/2 inches (315 x 240 mm). There is printed text on the back, as issued. Signed in the stone, not hand-signed. Medium: pochoir (after the lithograph). Printed in Paris in 1927 at the atelier of Daniel Jacomet and published by Henri Floury. The total sheet size is 10 1/4 x 8 inches (260 x 200 mm). Plate-signed with the Pierre Bonnard monogram signature (not hand-signed). Pierre Bonnard lithograph "Rue le soir sous la pluie"
Medium: multi-stone color lithograph (after the original Bonnard lithograph). Printed in Paris on Renage paper in 1952 by the Mourlot atelier, in faithful recreation of the original. According to the publisher, "the lithograph was pulled by Mourlot Freres in the same technique, using the same color range and number of stones as originally employed by the artist". The image measures 7 x 10 inches (181 x 253 mm). The total sheet is 9 1/2 x 12 1/2 inches (240 x 315 mm). There is printed text on the back, as issued. Not signed. Pierre Bonnard lithograph "Quelques aspects de Paris"
Pierre Bonnard lithograph "Les Boulevards"
Medium: multi-stone color lithograph (after the original Bonnard lithograph). Printed in Paris on Renage paper in 1952 by the Mourlot atelier, in faithful recreation of the original. According to the publisher, "the lithograph was pulled by Mourlot Freres in the same technique, using the same color range and number of stones as originally employed by the artist". The image measures 7 1/4 x 9 1/4 inches (185 x 235 mm). The total sheet is 9 1/2 x 12 1/2 inches (240 x 315 mm). There is printed text on the back, as issued. Not signed. Condition: there is age-toning in the margins. Pierre Bonnard lithograph "Le Pont des Arts"
Medium: multi-stone color lithograph (after the original Bonnard lithograph). Printed in Paris on Renage paper in 1952 by the Mourlot atelier, in faithful recreation of the original. According to the publisher, "the lithograph was pulled by Mourlot Freres in the same technique, using the same color range and number of stones as originally employed by the artist". The total sheet (including margins) is 9 1/2 x 12 1/2 inches (240 x 315 mm). There is printed text on the back, as issued. Not signed. Pierre Bonnard lithograph "Le Canotage"
Medium: multi-stone color lithograph (after the original Bonnard lithograph). Printed in Paris on Renage paper in 1952 by the Mourlot atelier, in faithful recreation of the original. According to the publisher, "the lithograph was pulled by Mourlot Freres in the same technique, using the same color range and number of stones as originally employed by the artist". The image measures 6 1/4 x 11 1/4 inches (160 x 290 mm mm). The total sheet is 9 1/2 x 12 1/2 inches (240 x 315 mm). There is printed text on the back, as issued. Not signed. 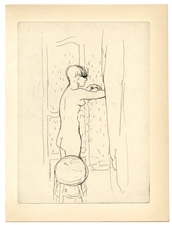 Pierre Bonnard lithograph "L'Estampe et l'Affiche"
Pierre Bonnard lithograph "Femme dans sa baignoire"
Medium: multi-stone color lithograph (after the original Bonnard lithograph). Printed in Paris on Renage paper in 1952 by the Mourlot atelier, in faithful recreation of the original. According to the publisher, "the lithograph was pulled by Mourlot Freres in the same technique, using the same color range and number of stones as originally employed by the artist". The image measures 7 1/4 x 8 3/8 inches (185 x 212 mm). The total sheet is 9 1/2 x 12 1/2 inches (240 x 315 mm). Signed in the stone, not hand-signed. Pierre Bonnard lithograph "Coin de rue"
Medium: multi-stone color lithograph (after the original Bonnard lithograph). Printed in Paris on Renage paper in 1952 by the Mourlot atelier, in faithful recreation of the original. According to the publisher, "the lithograph was pulled by Mourlot Freres in the same technique, using the same color range and number of stones as originally employed by the artist". The image measures 10 x 5 3/4 inches (254 x 146 mm). The total sheet (including margins) is 12 1/2 x 9 1/2 inches (315 x 240 mm). Not signed. Pierre Bonnard lithograph "Avenue du Bois"
Pierre Bonnard lithograph "Au Theatre"
Medium: multi-stone color lithograph (after the original Bonnard lithograph). Printed in Paris on Renage paper in 1952 by the Mourlot atelier, in faithful recreation of the original. According to the publisher, "the lithograph was pulled by Mourlot Freres in the same technique, using the same color range and number of stones as originally employed by the artist". The image measures 5 1/2 x 11 inches (143 x 275 mm). The total sheet is 9 1/2 x 12 1/2 inches (240 x 315 mm). There is printed text on the back, as issued. Not signed. Pierre Bonnard lithograph "Arc de Triomphe"
Medium: lithograph (after the original lithograph). Printed in Paris in 1927 at the atelier of Daniel Jacomet and published by Henri Floury. The total sheet size is 8 x 10 1/4 inches (200 x 260 mm). Not signed. Pierre Bonnard lithograph "Femme au parapluie"
Medium: multi-stone color lithograph (after the original Bonnard lithograph). Printed in Paris on Renage paper in 1952 by the Mourlot atelier, in faithful recreation of the original. According to the publisher, "the lithograph was pulled by Mourlot Freres in the same technique, using the same color range and number of stones as originally employed by the artist". The image measures 10 1/4 x 7 7/8 inches (260 x 200 mm). The total sheet is 9 1/2 x 12 1/2 inches (240 x 315 mm). There is an index number in the margin beneath the lithograph, and printed text on the back side, as issued. Signed in the stone, not hand-signed. Condition: there are a few stains. Medium: multi-stone color lithograph (after the original Bonnard lithograph). Printed in Paris on Renage paper in 1952 by the Mourlot atelier, in faithful recreation of the original. According to the publisher, "the lithograph was pulled by Mourlot Freres in the same technique, using the same color range and number of stones as originally employed by the artist". The image measures 7 3/4 x 9 3/4 inches (195 x 250 mm). The total sheet is 9 1/2 x 12 1/2 inches (240 x 315 mm). There is printed text on the back, as issued. Not signed. Medium: pochoir (after the lithograph). Printed in Paris in 1927 at the atelier of Daniel Jacomet and published by Henri Floury. The total sheet size is 8 x 10 1/4 inches (200 x 260 mm). Plate-signed with the Pierre Bonnard monogram signature (not hand-signed). Pierre Bonnard lithograph "Paravent a quatre feuilles"
Medium: multi-stone color lithograph (after the original Bonnard lithograph). Printed in Paris on Renage paper in 1952 by the Mourlot atelier, in faithful recreation of the original. According to the publisher, "the lithograph was pulled by Mourlot Freres in the same technique, using the same color range and number of stones as originally employed by the artist". Size: 12 1/2 x 19 inches -- 315 x 490 mm (total sheet); with text on the back side, as issued. Signed by Bonnard in the stone, not hand-signed. Condition: there is a center fold with stitch-holes from the binding. 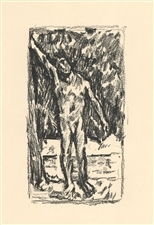 Medium: lithograph (after the original Bonnard lithograph). Printed in Paris in 1952 by the Mourlot atelier. Size: 9 1/2 x 12 1/2 inches -- 243 x 315mm (total sheet); the image measures 3 x 5 1/2 inches (75 x 135 mm). Not signed. Pierre Bonnard lithograph "Scene de famille"
Medium: multi-stone color lithograph (after the original Bonnard lithograph). Printed in Paris on Renage paper in 1952 by the Mourlot atelier, in faithful recreation of the original. According to the publisher, "the lithograph was pulled by Mourlot Freres in the same technique, using the same color range and number of stones as originally employed by the artist". The image measures 10 1/4 x 5 5/8 inches (260 x 150 mm). The total sheet (including margins) is 12 1/2 x 9 1/2 inches (315 x 240 mm). Signed in the stone, not hand-signed. Pierre Bonnard lithograph "Scene de famile"
Medium: multi-stone color lithograph (after the original Bonnard lithograph). Printed in Paris on Renage paper in 1952 by the Mourlot atelier, in faithful recreation of the original. According to the publisher, "the lithograph was pulled by Mourlot Freres in the same technique, using the same color range and number of stones as originally employed by the artist". The image measures 7 1/4 x 8 5/8 inches (183 x 220 mm). The total sheet (including margins) is 12 1/2 x 9 1/2 inches (315 x 240 mm). There is printed text on the back, as issued. Signed in the stone, not hand-signed. Pierre Bonnard lithograph "Rue vue d'en haut"
Medium: multi-stone color lithograph (after the original Bonnard lithograph). Printed in Paris on Renage paper in 1952 by the Mourlot atelier, in faithful recreation of the original. According to the publisher, "the lithograph was pulled by Mourlot Freres in the same technique, using the same color range and number of stones as originally employed by the artist". The image measures 10 1/4 x 6 1/4 inches (265 x 165 mm). The total sheet (including margins) is 12 1/2 x 9 1/2 inches (315 x 240 mm). There is printed text on the back, as issued. Not signed. Here at Affordable Art 101 online, we carry a broad assortment of original and other hard-to-find Pierre Bonnard lithographs. Many of these lithographs are scarce pieces that would greatly add to your home or gallery.